But first, a word about how this new transtion state has been obtained. The DFT treatment used is quite standard (B3LYP/6-31G(d) ), and one can indeed locate a transition state using just this approach (this is how the previous model was obtained). One has to work very hard to orient the starting guess for the geometry so that as many hydrogen bonds between the waters themselves, and to the substrate, are created. The previous model took quite a few guesses and attempts! 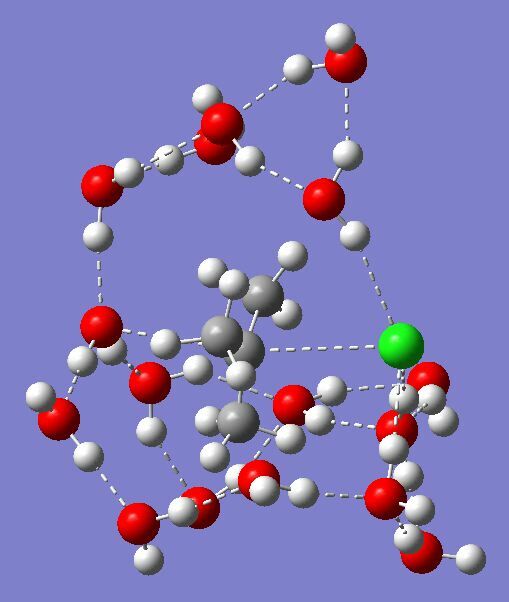 The solvent in such a model is simulated by the explicit water molecules themselves. Of course, the quality of the solvent then depends on how many water molecules are used. A proper solvent field using explicit water molecules is thought to require 100s of water molecules! But a reasonable approximation/compromise may well be 13. So how can the model be improved? Well, in many ways, some of which include treating the dynamics of the system. But I will stick just to two. Firstly, we assume that the water molecules are used to form a bridge between the incoming nucleophile (another water) and the leaving group (the chloride). In the previous model, two such bridges were constructed using the 13 water molecules. But in fact, there is still space between two of the methyl groups to construct a third bridge. This takes the total solvent molecules to 16. The result of this optimization is shown below (and can be seen in original form at the following DOI: 10042/to-2894). Transition state for Sn1 solvolysis of tert-butyl chloride. Click for animation. The overall free energy is in great agreement with experiment! But the entropy is the wrong sign!! The calculation is predicting that the transition state is more rigid than the reactant. One can see how this might happen, since the greater ionic character produces very much stronger hydrogen bonds, which strengthen the three solvent bridges. It may be simply that the rigid-rotor-harmonic-oscillator approximation breaks down horribly for the entropy in this calculation. But it is encouraging that the activation barrier is reproducing experiment, which suggests the model cannot be completely wrong! This entry was posted on Wednesday, November 11th, 2009 at 10:48 am and is filed under Interesting chemistry. You can follow any responses to this entry through the RSS 2.0 feed. You can leave a response, or trackback from your own site. Most of the starting configurations had more waters around the chlorine, but since there was no confining box used, they wandered away (this is not a statistically tested assertion of course). Steve is of course correct that as there are more and more configurations, the entropy has to be handled statistically for the ensemble. This probably is a major cause of the error. Firstly, the initial trajectory can complete, in which case inversion has occurred. The original nucleophilic water than looses a proton by proton transfer along one of the water chains. Result: inversion. Or, if the proton is not lost, a water molecule then attacks from the face previously occupied by chlorine, displacing the protonated water (easily the best leaving group) on the other face. Overall, retention has occurred via a double inversion. So the reaction is pretty much defined by the dynamics of what happens around the transition state, and in effect which order things happen. With tert-butyl chloride, these two dynamic processes must be more or less equal, hence racemization. 1) We have done some microsolvation studies of amino acids (glycine and cysteine) and found that as one places ever more water molecules about the structure, there are ever more close lying configurations. So I do wonder whether the TS you’ve found is (a) the lowest possible and (b) whether a whole lot of other TSs are very close in energy. This will certainly affect the entropy. Given that the chloride carries the most dense region of negative charge, I would wonder whether there are configurations with more waters associated around the chlorine – both with just 16 waters, and especially when more waters are included. 2) But be that as it may, the TS structure has really got me thinking about just what species really exist in this solution. We teach the SN1 reaction as having in this case free t-butyl cation in solution. But what this TS suggests is that we get direct water displacement of chloride, from the backside, and then perhaps water-water exchange and that leads to racemic product? Does “free tbutyl cation” exist in aqueous solution? Revising my statistical mechanics of course reminds of the simple formula that if there are N (more or less equal) microstates, the entropic correction for the ensemble is simply R*Ln N.
Working backwards, and assuming that the discrepancy between calculated and observed entropy is due to N equivalent microstates, one finds N ~ 2300. Seems a tad high to me, but it might account for some of the difference between calculated and observed entropy. Also one must consider the reactant configurations as well as those of the transition state, since its the difference between the two that controls the actual kinetics.